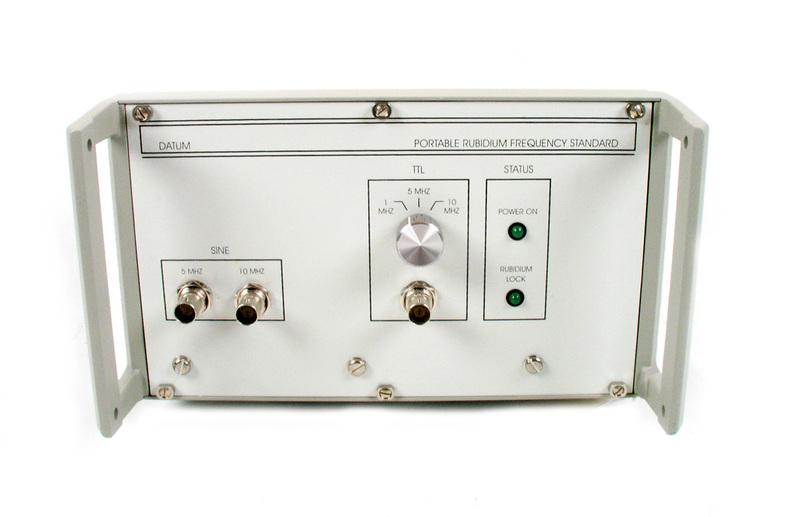 The PRFS is one of Datum-Irvine's family of frequency standards and test instruments. It has been designed as a portable instrument for laboratory or field use. Three front panel outputs are provided, two fixed, and one switchable. Instrument status is provided through two front panel LEDs indicating that power is applied and that the Rb oscillator is locked. The Model PRFS is ideal for portable applications with a superior retrace of 5E-11 (after 1 hour power on at 25°C and up to 24 hours power off). This unit can be used as the master oscillator in laboratories aboard ships, or for field calibration services. It's ultra-stable frequency outputs have excellent short and long term stability. It can also be used to discipline radar, navigation or communication systems, as well as test, measurement and diagnostic equipment. In addition to its use as a calibration tool, the PRFS provides the accuracy and stability of state-of-the-art, atomic resonance locked oscillators for any type equipment, which accepts externally applied time base of 5 and 10 MHz sine and 1, 5, or 10 MHz TTL signals.